Pressbooks is a simple book publishing tool. Put your book content into Pressbooks, edit as you like, and export into ebook and PDF/print-on-demand formats. This chapter will gives you a very quick overview of Pressbooks, which can be explored in more detail in the rest of this Guide. Register for a Pressbooks account. Add Book Information (title, author name etc). Add/Organize Text (your chapters etc). Choose Book Design Theme (what your book will look like). Export your book in required file formats: MOBI (for Kindle), EPUB (for Nook/iBooks etc), PDF (for print and print-on-demand). In the registration process, you will add: your username, email address, web address of your book, and book title. We’ll send you an email to complete the registration and activate your account. STEP 1: Start the registration process here, and follow the easy instructions. The Book Information screen is where you edit and add important information about your book: author name, publication date, publisher. You can also upload your cover here, and add your copyright notice. You can fill in as little or as much information as you like. 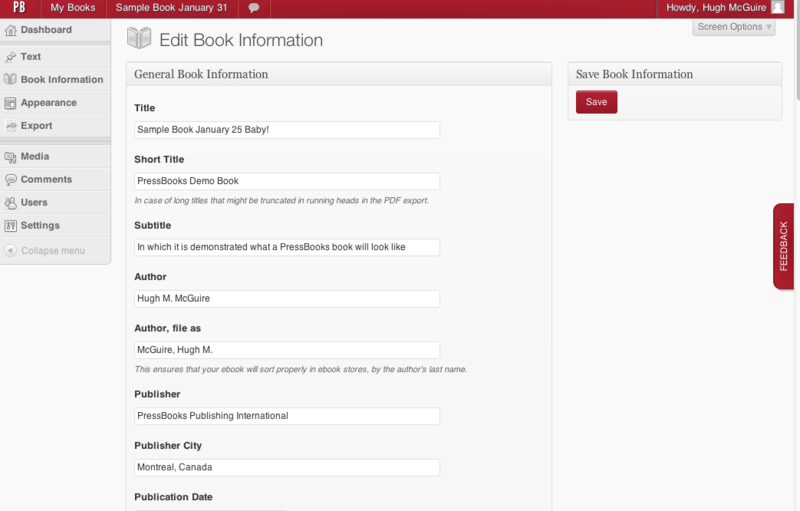 STEP 2: Add your Book Information, including title and author information. 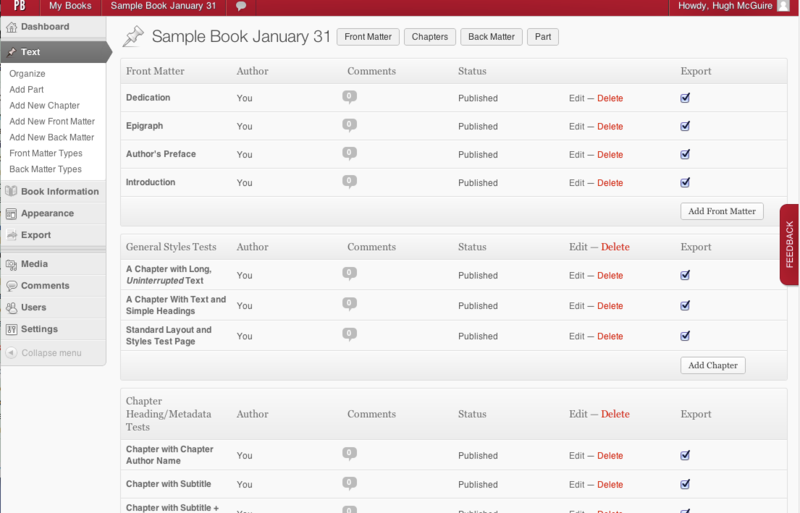 On this screen you can add, edit and arrange the order of the contents of your book. Add chapters and parts, and edit it as you like. You can also add “front matter” here (things like your introduction and preface), and “back matter” (things like your index and bibliography). Pressbooks comes with 20+ professionally-designed book design themes to choose from. 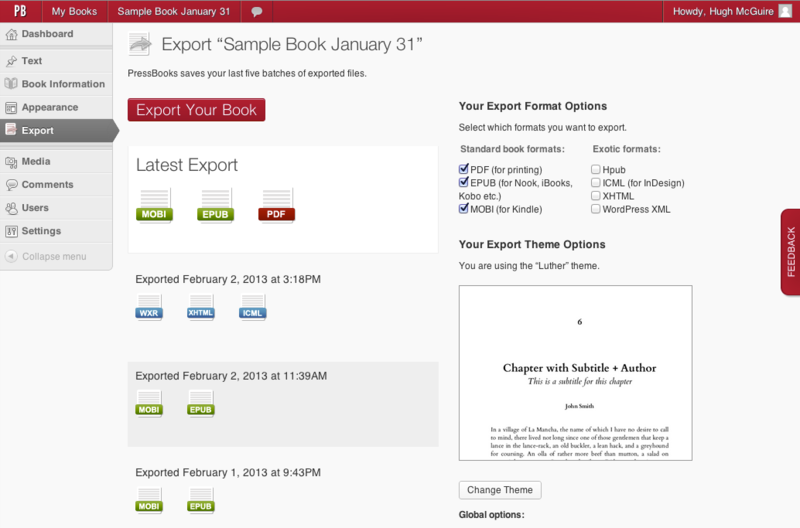 Choosing a theme governs the look and feel of all your exports, including: EPUB, Mobi, PDF and web book. You can also change the look of your book by changing the Theme Options. You can decide whether or not you want a table of contents, whether you want part and chapter numbers added automatically, and adjust a few other things. There are global options, PDF options and ebook options on separate tabs. Pressbooks gives you a one-button export, and you can select PDF, EPUB, Mobi (Kindle), as well as a few more exotic options. If you’d rather watch a quick demonstration, check out this series of tutorial videos for getting started. You can start making a book right now … register or login to Pressbooks here. The 5-Step Guide to Using Pressbooks by admin is licensed under a Creative Commons Attribution 4.0 International License, except where otherwise noted.